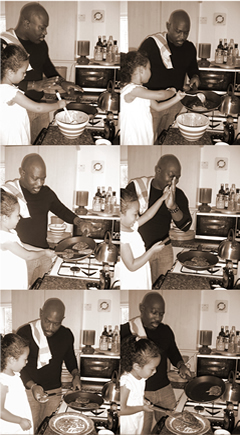 Madison is a hands-on family man, chef, producer, speaker and former serviceman with roots in London, Jamaica and Detroit. In 2004, after being awarded a four star rating from The Times as executive chef of Ashbells in London’s West End, he established Madison Cowan LLC, a global culinary production company that oversees operations in licensing and consulting, television production and private dining that has reached throughout Africa, Europe, Japan and South America. She made certain I knew my way round the kitchen and would never depend on anyone for a meal. Sage advice I now impart to my own child. In 2010 Food Network selected him as a contestant for their hit Primetime series Chopped where he competed and won three consecutive episodes to become the first ever Grand Champion. Following appearances on NBC’s Today Show and CBS This Morning, in April of 2012 he was victorious on Iron Chef America’s epic Battle Kale and co-starred in BBC America’s exciting travel series No Kitchen Required. Madison returned to the tube in late 2013 as a recurring judge in Food Network’s delectable series of chance, Kitchen Casino and currently features on multiple series such as Beat Bobby Flay, Guilty Pleasures and Iron Chef Eats. Most notably, Madison’s charitable endeavours include advocating globally on behalf of the Alzheimer’s Association in its quest to cure the dementia related disease, serving as culinary council member for Food Bank For New York City, a leader in the movement to end hunger and poverty, and signing on with former First Lady Michelle Obama’s Chefs Move To Schools initiative, which creates partnerships for professional chefs and public schools nationwide with the goal of solving childhood obesity within their communities by collaboratively educating children about food and healthy eating. © 2018 MADISON COWAN, LLC | ALL RIGHTS RESERVED.